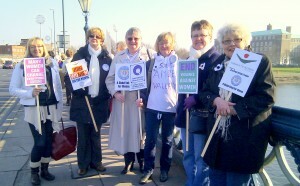 International Women’s Day 2011 – read how Soroptimists Worldwide commemmorated this day. See also our Human Rights/Status of Women page for further information. On March 8th six of our members took part in a 120 strong demonstration on Trent Bridge, Nottingham, during International Women’s Day, to support ‘Stronger Women Build Bridges for Peace’. On that day, women and men stood on 646 bridges in 70 countries to publicise Women for Women International and their drive for peace worldwide. White poppies were worn as a symbol of peace.